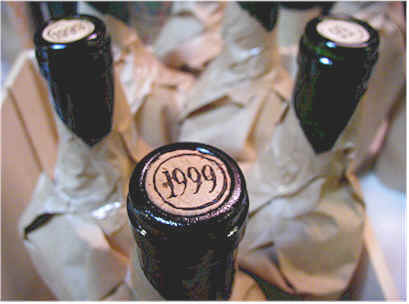 The 1999 vintage in Bordeaux might have had most winemakers crying in their beer. The region saw significant amounts of rain during September and October and had to work diligently to produce quality wine. More than one producer told me they had to select various lots quite rigorously to bottle good wine under their "main" label, siphoning off lesser lots to secondary labels. 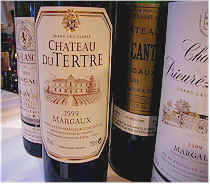 We assembled a set of wines from the Margaux area in this blind tasting of wines from the 1999 vintage. 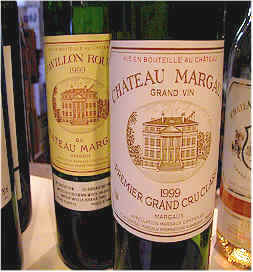 Two wines were significantly ahead of the pack, both from Chteau Margaux. 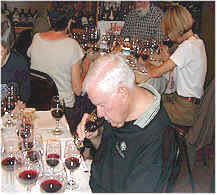 Interesting their "second" wine was tabbed as the "number one" selection of 5 of the 16 tasters. 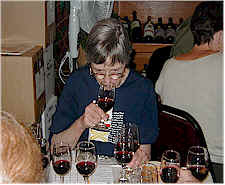 Had one taster not placed the wine in 8th, but third (or higher), this second tier offering would have won the tasting! One taster found this to have an "alcohol burn," while another fellow said it had "nice aromas, but heat and alcohol on the palate detracted...it's also unusually soft and very low in acidity." Someone else described it as "Too soft and with a very short finish." The low acidity level was detected by a number of other tasters, one saying "it deteriorated in the glass during the course of the tasting." One lady found "Tarry and sulphur notes and a burnt-match character on the palate." One fellow was more positive, finding "Tight, silky texture and some coffee notes with currants, tobacco and a light finish." I was attracted to the cocoa bean and mocha character of the nose, with a nice touch of oak. The wine is more soft and supple than the rest of the wines in this tasting, making it rather approachable now. I liked the cedary flavors, too. And, now knowing what it costs, I especially am a fan of this! Five to 12 years of aging potential. Two stars. "Light, soft and delicate, this has a dollop of unsweetened chocolate, with some tea and sage notes." said one fellow. Another taster described it as "Elegant and it opened nicely, with good structure and it's quite complex." Another found it "Bold, with full fruit notes, nice tannins which are well-integrated with the wine." Someone else said "It's not a blockbuster, but is very pleasant, elegant and it has a long finish." Another taster found it to have a "minty aftertaste and it's short...average quality." I found some rather lovely cedary notes and a toasty quality on the nose. Elegant on the palate, it's got some berry notes and does tail off a bit rapidly. Five to eight years of cellaring potential. One-and-a-half stars. "Very appealing," said the first critic, finding "Blackberries, polished cassis tones and some smoked Italian sausage notes." One lady found "pickle barrel fragrances, with sweet oak, brambly notes and herbs. It's tannins are quite bitter." Another person found the tannin and acidity to be "overwhelming." One taster found a "good bouquet, with cedar, violets, toasted bread and some minty notes...very complex and sensuous with substantial glycerine and coffeeish mocha notes." Another fellow said he "didn't mind the tannins and I like the sweet oak." I found this to be decidedly different from the other wines, showing a fragrance which reminded me a bit of Pinot Noir. There is a high-toned fruity quality to the nose, with some gamey and root-like fragrances in the mix. It's got good structure for 8-15 more years of cellaring and tasted more Cabernet-like than I was led to believe by the aroma and bouquet. One-and-a-half stars. "Tart and tannic, but it does have some fruit." said one participant. Another person found "cassis and black fruits with berries and herbs on the finish." One fellow described this as a "big wine but with no lingering aftertaste." Another detected some "lavender." Someone else said it's "Intense, with herbal fruit on the nose and palate and it has good Cabernet character." I found this to display an intriguing spice note, reminding me a bit of an Asian ginger spice fragrance. There's some cassis here, too, with a nice bit of oak. Lots of dark fruits on the palate, with some cocoa and spice. Two stars. "This is a lean and mean wine." said the lead-off batter. Someone else found it to have "Light herbal notes and some firm, bitter tannins with a lot of gritty and extracted elements. It's like they were trying to 'stretch' this wine." 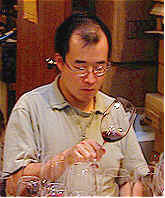 One fellow found it "loses focus, with ample fruit but being overwhelmed by tannin and acidity." Another man found it "Well balanced, with a sensuous finish and coffee and mocha notes." One taster felt it "opened with airing," while another found "Currants, tobacco, oak and a short finish." I thought the wine relied on the wood quite a bit, but was still rather attractive. It's fairly big on the palate, with some sweetness from the oak. Eight to 15 years' worth of tannin are in evidence. One-and-a-half stars. This wine nearly won the tasting! One taster said "It's a finesse wine, with a subtle core of un-ripened currants, plum skins and a hint of rose petals." A second taster found "Cola notes and a strong level of tannin." Another person was of a similar mind, finding it "Very astringent and very tannic." A fourth person found "Plum notes and it's somewhat austere, but with good balance, overall." "Nice finish and it needs more cellaring." said someone else. One taster was less than enthusiastic, saying it's "Correct but empty." Another found it "Closed, tannic and it might have a lot of fruit." Another person found "plums", while someone else got "blackberries." I was attracted to the sweet violet fragrances and black fruit aromas of this wine, all framed with a cedary bit of oak. I like the same elements on the palate, with big, rich flavors and good structure. I'd consider eight to 15 years of cellaring and gave this a two star rating. "Fine, elegant and complex, this displays ripened berries and oak, with a smoke house, roasted meat sort of character." said the lead-off batter. Another person found it to be "generously oaked and very voluptuous." Someone else found it to have "Soft tannins and a smooth finish." Another felt it "developed nicely in the glass and came around nicely. It should have a good future." Someone else found the "oak to be a large component here." I found nice cassis notes of the Cabernet, with hints of olives and herbs and some black fruit aromas. A touch of earthiness is also in the mix. It's got good structure and perhaps this accounts for its flavors being a bit less than "grand" at this stage. Tannic, youthful and showing cassis and cedar on the palate, you'll want to hold this for 10-15+ years. One-and-a-half stars. Maybe more.